The LUCY is a drawing tool I wish I had in art school. The device has been around for 500 years and though it uses no electricity, it's able to project images from your environment onto your drawing pad. The LUCY will make you feel like you have special abilities by letting you look at two things at once – and have them converge in the same spot for you to draw on top of. 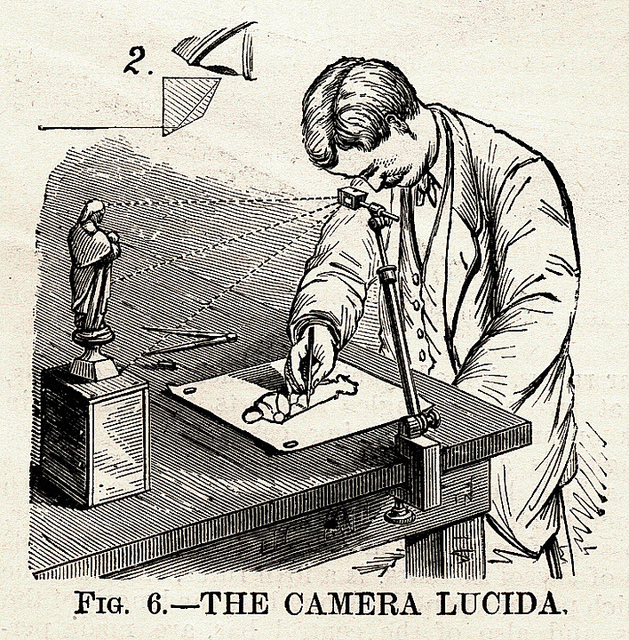 Essentially, the LUCY is an improved, simplified version of a camera lucida – below is a sketch and an explanation of how it works. First - the object you want to draw sits anywhere in your environment with the LUCY angled toward it. The image of the object passes through a one-way mirror and reflects into a second mirror and then back again onto the first mirror. When you look through the top of the device, you see not only straight through to the paper you’re drawing on, but you’ll also see the reflection of the object you want to draw. The brighter the environment around the object, the brighter the object will be on the paper. Then it’s up to you to trace what you see. Here’s a video that shows the LUCY in action. By helping you quickly block in shapes for layout and proportion, your final drawings will naturally be improved - how many times have you sketched only to find your subject's body parts cut off because you miscalculated your starting position? If your answer is zero you should stop reading now - because you’re kidding yourself. Even great artists fall into that trap from time to time. Here’s a bit of art trivia I most certainly just made up: Sandro Botticelli was famous for having to paint his masterpiece The Birth of Venus a second time. Because he started with her head and painted her legs last before realizing too late that he had cut off her feet! Imagine the time he could have saved if he had a LUCY of his own. Again, I probably made that last part up - Moving right along. The LUCY takes away the guesswork in the most important phase of drawing but I know what you're thinking - "Isn't this a cheaters tool?" and to me the answer is simple. If master painters used the camera lucida to help them with the under drawings of their own paintings, how can we say it’s cheating. As a teaching tool, the LUCY is amazing and I have to admire the effort that Les Cookson has put into it. His simplified version of the camera lucida has come a long, long away from its predecessors. If you like ancient technologies that enhance your artistic talents, you should definitely check out their Kickstarter and become the first kid on your block to own something that took over 500 years to perfect!